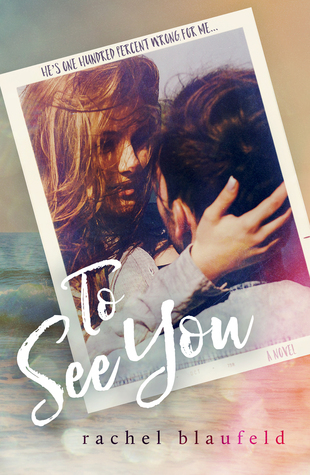 To See You by Rachel Blaufeld is NOW LIVE! No cliffhanger, only hard-earned unexpected love. And angst. “Cheers.” My seatmate good-naturedly tipped his glass toward me. He wasn’t going to leave me alone. I took a long gulp and looked back at my computer screen. I tugged at my turtleneck; it was so freaking hot all of a sudden. My nosy neighbor’s face had a slight sheen to it, clearly from being hot, and now his warmth was seeping into my space. What the heck? Why was I even answering him? Because he asked, and if I was honest, it was the nicest anyone had been to me in months. Furthermore, why did I sound like I was on an interview? Or an infomercial? He was kind—I could tell—and his smile was gentle and calm, his eyes like warm coffee with just the right amount of cream swirling through it. I turned a little in my seat to face him and my knee brushed his thigh. I let my gaze travel his Beastie Boys T-shirt until I settled on his computer. Playing on it was a rom-com, one I’d never seen before, but Katie What’s-her-name—all stunning, shiny hair, celebrity mom, perfect life—was front and center. Her arms were full of shopping bags and she was wearing a big grin on her perfect face as she walked down a city street. “You don’t strike me as the romantic comedy type.” I felt my eyebrow lift. I wasn’t sure if I was teasing him or myself as the question floated from my mouth. He laughed. It was soothing and comforting like a coffee-and-Kahlua on a cold night, and warm like the sun on the first few days of summer. I allowed my eyes to close and imagined he looked like somebody else—not someone else totally, but just different. Fit, not slender but muscular. He still had the same gracious smile and inviting eyes, but he wasn’t wearing a music T-shirt in my imagination. Maybe a Henley? And dark-wash jeans instead of the regular everyday ragged blue I’d noticed him wearing. “It’s work too,” he said, interrupting my fantasy. “Oh.” I chugged the balance of my mimosa, cooling the wash of desire recently conjured up from my brain. He shifted his gaze over fully to me now. His eyes weren’t exclusively deep brown; tiny flecks of amber circled his pupil. They were captivating in a weird way, as if they didn’t belong with this guy. I’d never met a slob who was so interesting before, yet he was definitely intriguing. And not really a slob—that was my own bias. Clearly, I was having some sort of psychotic breakdown on this airplane. To See You by Rachel Blaufeld is an inspiring stand-alone romance. It cuts through all the niceties of society and lets you in to the true inner thoughts of the main characters. I normally love to read about alpha males with confidence literally oozing from them, but in this case, Layton was perfect. He wasn't alpha but he was in no way a push-over pansy either. He was true and confident in spite of his inner monologue second guessing himself. Charli was your typical mean girl - at least on the outside. She found a friend (or rather her friend found her) early in college and was absorbed into the mean girl group. She always strived to fit but never truly, deep down, felt completely comfortable. Always behaving a certain way can make it second nature, so even when she hears herself talking and is inwardly cringing at how she sounds, she cannot seem to stop herself. Thankfully, both Charli and layton found a way out from their worst versions of themselves and eventually evolved into the best version the could be, together. But the journey - oh man, the journey... It was awesome and epic and I absolutely loved this book. Couldn't stop reading! To See You by Rachel Blaufeld from Bibliophile Productions on Vimeo.